I hope to be making a cassava oil down that I will share with y’all in the near future. 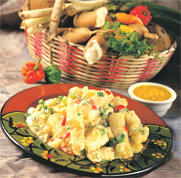 Until then Trini food blogger ‘can cook, must cook’ has 2 classic recipes for a breadfruit oil down over at her blog. Check it out!